Life doesn’t stop, and neither do your customers – whether you’re hearing the faint whisper of “on the move, on the go, take away”, you need to keep up. And what better place to do it than at the leading food to go trade show, Lunch on 20-21st September! One of our personal favourites, it hosts a plethora of brands all under one roof, spanning across baking, confectionery, sandwiches to coffee (of course), soft drinks and alcohol. As well as perusing the food and drink stands, you can also brush up on the latest innovation in ingredients and packaging. Not only that, if you’re into all things tech, you can see the latest array of equipment, EPOS and online ordering systems. Call this the one-stop shop show for anything food and drink on the move. Whilst you’re there, make sure you take a trip to the innovation section – it showcases the most innovative food to go products launched in the last 12 months. If you’re visiting the show on day 1 then you can have your chance to vote for the winners. Not going to be there until day 2? Don’t worry, you can see the live pitches from the finalists and hear who is going to be crowned this year’s winners. We love to take a peak in the start up zone, some of the next big brands and food and drink innovation can be found here. Plan your day so you can listen to some keynote speakers – some big names from the likes of Pret A Manger, LEON and Greggs are talking this year. Regardless of your area of interest its always worth making time for at least one speaker. They’re packed full of insightful knowledge and will often make time to take questions, or give you some one on one time for any specific queries you may have. Not to be missed! Network network network. 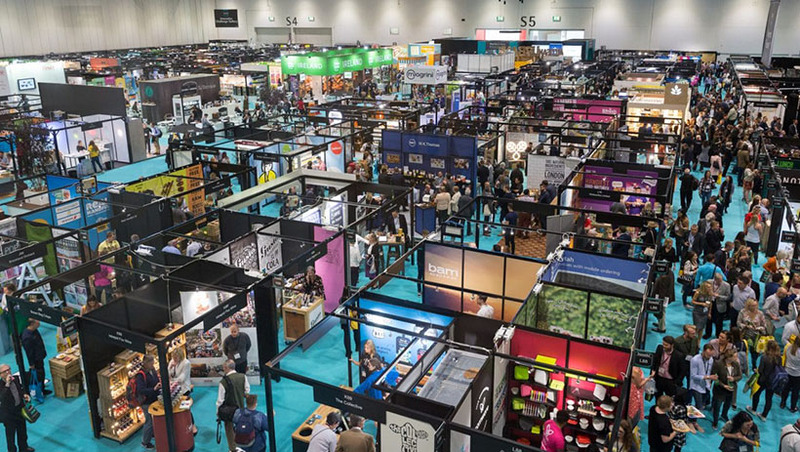 Lunch brings together a truly amazing collection of food and drinks brands under one roof, so make the most of it – don’t forget your business cards. Fancy a chat whilst you’re there? We love to talk over a hot coffee and croissant, so why not drop us a line. We’d love to hear about your brand and see how our team of experts can help. Drop me a line at vhari@thefoodmarketingexpets.co.uk or 01480 276555. We’re celebrating our new rebrand!